(2018) Kenya’s newcomer Erick Kiptanui clocked a sensational course record of 58:42 in the Berlin Half Marathon, equalling the fastest time in the world this year. Running only his third race in Europe and winning for the third time, Kiptanui moved to equal fifth in the all-time performances for the distance. His impressive running on Berlin’s fast course left him just 19 seconds short of the world record. Kenyans dominated the event and took the first seven places. Emmanuel Kiprono and Richard Mengich finished second and third with 60:29 and 60:36 respectively. The best non-Kenyan runner was Germany’s Homiyu Tesfaye who took eighth place in 62:13. Ethiopia’s Melat Kejeta won the women’s race in sunny but windy conditions with 69:04. Switzerland’s Martina Strähl was second and set a Swiss record of 69:29, improving her personal best by more than two minutes. Anne-Mari Hyryläinen of Finland took third with 71:04, also setting a personal best. At her second attempt the European steeplechase champion Gesa Felicitas Krause of Germany finished the distance for the first time and placed fifth. Her time of 72:16 was the fastest time by a German woman this year. 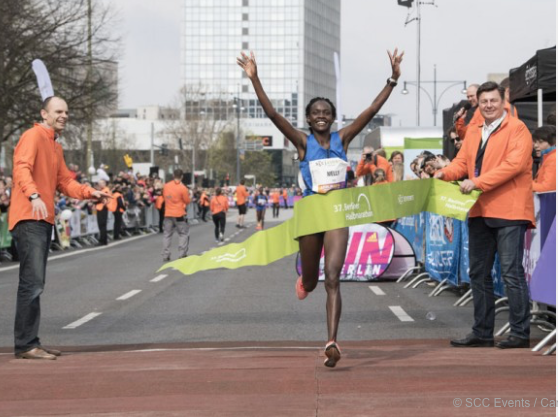 A race record of 36,000 athletes entered the 38th edition of the biggest and highest quality German half marathon, taking into account the events held in conjunction with the main race. Around 250,000 spectators lined the course. Erick Kiptanui and his fellow Kenyan Vincent Kipchumba, the latter acting as pacemaker, established a clear lead in the early kilometres. Aided by a tailwind, they reached 10km in a super-fast 27:32 which was on course to break the world record of 58:23. “It was my plan to run fast since I knew that the Berlin course is flat,” explained Erick Kiptanui, who is coached by the renowned Italian trainer Renato Canova. Once Kipchumba had dropped out between 12 and 13 kilometres and the course ran into a headwind, Kiptanui was forced to slacken his pace but he clearly showed he has the potential to become the next top Kenyan marathon runner. “I shall definitely continue to run on the road and plan to make my marathon debut,” said Kiptanui, who had concentrated on running 1500m in the early years of his career. Melat Kejeta ran unchallenged to victory in the women’s race in 69:04. “After ten kilometres I didn’t feel that great because I have a cold and was running into a headwind,” explained the Ethiopian runner who has lived in Kassel in Germany for four years. She has applied for German citizenship and hopes to run for Germany in the foreseeable future. The European steeplechase champion Gesa Krause ran a solid, even-tempo race and finished the leading German in fifth. Just over a year ago she dropped out of her first attempt at a half marathon in Ras Al Khaimah in the United Arab Emirates. “I felt good in the race today and enjoyed it. But it’s new territory for me, of course,” reflected Gesa Krause, who will now turn her attentions to the 3,000m steeplechase and her defence of the European title in Berlin this summer. “It’s certainly possible that I’ll return to the Berlin Half Marathon,” said Krause, who ran over half the distance with Katharina Heinig. They train together and Heinig finished two places behind in seventh. “I’m happy to have set a personal best but not everything went right. 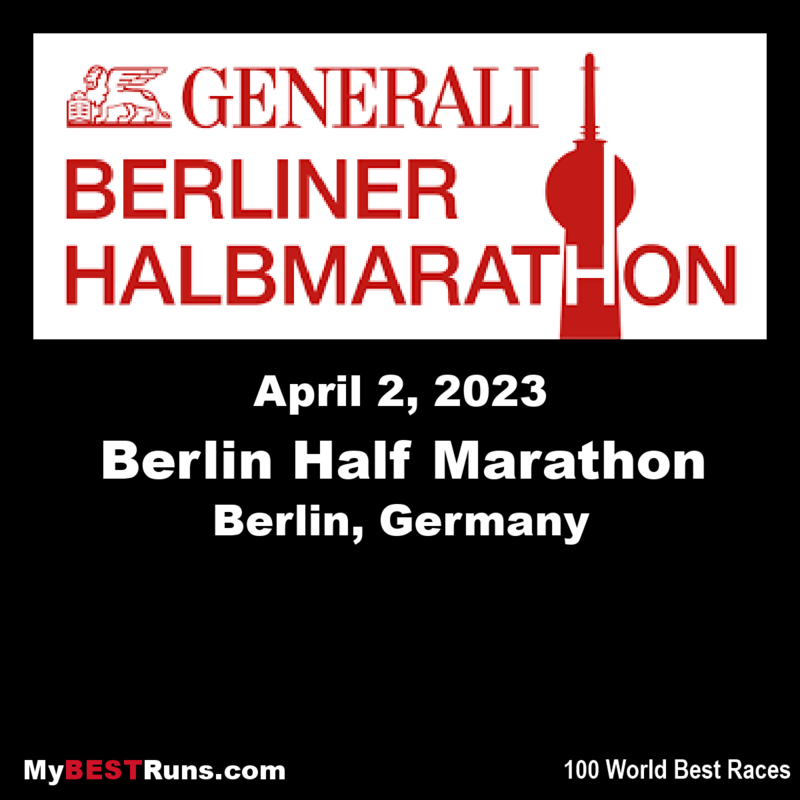 I really wanted to run 70 minutes,” said Katharina Heinig, who is the daughter of the former world class marathoner Kathrin Dörre-Heinig.